With summer just around the corner, children are getting off the couches and back to running. We’re always encouraging them to be active. However, it can be quite disheartening when they’re debilitated due to foot pain. It’s easy to dismiss this as ‘growing pains’, believing that they will go away quickly with growth. However, growing pains can occur intermittently for years. Why let children be debilitated when we can provide treatments to keep them active and pain free? The most common paediatric injury that podiatrists treat is heel pain. There are many conditions that can affect the heel and clinical assessment should be carried out to ensure accurate diagnoses. However, the most common injury affecting the paediatric heel is something that podiatrists call Calcaneal Apophysitis. First discovered by the orthopedic surgeon James Warren Sever, it is often referred to as Severs disease. Those of us in the field discourage the term, as we feel that the word “disease” is insensitive and does not truly represent the pathology. Therefore, the term Calcaneal Apophysitis is much more wildly used amongst professionals. What causes heel pain in children? To understand the condition, we must first understand the anatomy of the heel bone. As children, our heel bone (Calcaneus) is in two parts which is joined together by a cartilaginous tissue called the apophysis or growth plate. Trauma to the apophysis from either impact forces from the ground or traction forces from the Achilles/calf complex are the main culprits. 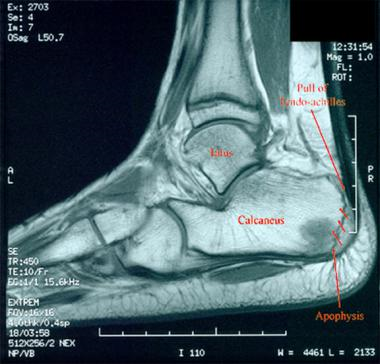 Calcaneal apophysitis usually resolves as the apophysis fuses, bringing the two parts of the calcaneus together. Hence why heel pain is often referred to as a growth problem. The apophysis usually appears at 7 years of age, and completely fuses by 15, however there is much variation between boys and girls. Tight calf muscles tend to lead to increased tractional forces upon the apophysis due to its insertion to the calcaneus via the Achilles tendon. We often see tight calves in very active children, especially those involved in high impact jumping/running activities such as netball, basketball, soccer and cross-country sports. The problem is compounded by the fact that with normal growth, the bone tends to grow quicker than muscle, which also contributes to tight calf muscles. Foot morphology is another important aspect to consider. A high arched foot is notoriously poor at absorbing shock. When the foot strikes the ground, the impact forces transmit directly upon the apophysis. On the other side of the spectrum a flat foot tends to increase the work of the calf muscles, thereby increasing tractional forces on the apophysis. Children may not need to have severely flat or high arched foot, however sitting anywhere on this spectrum can lead to increased forces impacting on the apophysis. Treatment is targeted at reducing the amount of forces that would irritate the painful area. The best way to manipulate these forces is through orthotic therapy. Orthotics are devices that are worn within shoes and work by redistributing forces that act upon and internal to the foot. Orthotics come in two different varieties and each one is chosen depending on the foot being treated. A custom device is made specifically for an individual’s foot type and given a prescription unique to the individual. The prescription process is similar to prescription glasses, which are made specifically on independent variables. The other orthotic type are prefabricated orthoses. These are non-custom devices and tend to reduce forces less so when compared to custom orthotics. Prefabricated orthoses can in some individuals have a major impact on foot pain. At ACT Podiatry, we will be able to assess which type of insert your child needs. In conjunction, a calf stretching program will help reduce calf stiffness. It cannot be stressed enough that although calcaneal apophysitis is a common condition, there are many other conditions that must be excluded to ensure appropriate treatment. For instance, calcaneal apophysitis is very different to a Salter-Harris fracture, a fracture through the calcaneal apophysis, therefore treatment is vastly different between the two. Therefore, it’s crucial that a clinical assessment is made to ensure adequate treatment is undertaken. Calcaneal apophysitis usually resolves in time, however pain can be debilitating, stopping children from doing the things they love. There are many interventions a podiatrist can implement to treat the condition depending on the specific needs of the patient. It’s important to be able to keep children active and at ACT Podiatry, we can help keep your child active and pain free!